Equipment is on a rental agreement for 5 years. After that period, one can decide to either upgrade or take ownership. What would happen if ME Systems close down. We have a sister company, which will be able to transfer all immediately. Any VOIP company will easily transfer the entire system. Can we assist you with a solution where there is no Telecom infrastructure? Yes, we have several solutions for this situation and even satellite for the most desperate situations. Contact us for assistance. What is the line quality of normal Telecoms versus VOIP? The standard copperwire Telecoms line quality, according to ICASA rating is 3.2. VOIP's rating is normally 3.6 mos score. ME Systems ICASA rating has a 4.2 mos score. What happens when my you port my telephone line? The telephone number are bought and configured on our system. The advantage is that you still keep your number when transfering to the VOIP solution. The advantage for when you move offices out the Telecoms area of that number, you can still keep that number. Do I still have to pay other Telecoms accounts after moving to ME Systems? ME Systems port the number on their system. It takes more or less 30-60 days for transfer. After the process is finalized, you don't have to pay any other telecoms account. How long are ME Systems in business? What is the warranty op all equipment? All equipment carries a one year warrenty. 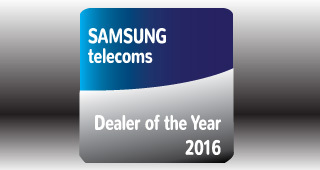 Our Samsung equipment also have a 3 year service warrenty, optional 5 year. What is our Support Reaction time? Our reaction time is 2 to 4 hours, depending on distance, but no longer than 8 working hours. Is VOIP's downtime less than other Telecoms Solution? Due to the fact that VOIP is a Wireless Solution, downtime is much less. It is not dependent on copper wire. We also have several solutions to reduce downtime, like ups systems. VOIP (Voice over Internet Protocol) is the technology that allows telephone calls to be made over any data link like ADSL, Optic Fibre or LTE.